Beijing’s poor air quality is nothing new. Yet, the visible air pollution from the “sand-smog” on February 28, 2013 still shocked the world. The Washington Post posted a photo of downtown Beijing, entitled, “The most shocking photo of Beijing air pollution I’ve ever seen,” taken by journalist Bill Bishop in Beijing on the morning of February 28th. In this photo, the 81-story China World Trade Center III skyscraper only a short distance away is all but invisible. To illustrate just how bad the air pollution was that day, the photographer also includes a photo of the same view, taken on a clear day, for comparison’s sake. 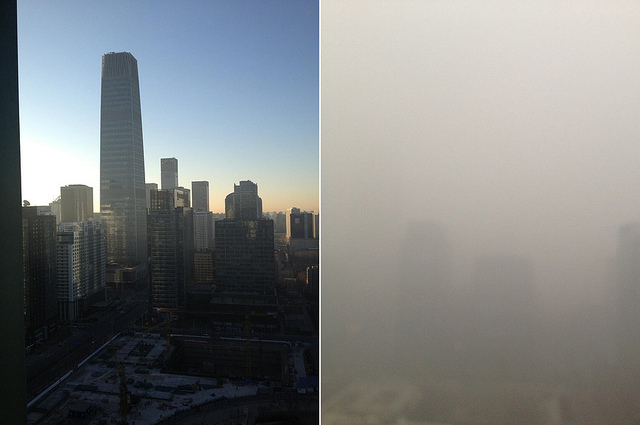 The same view of Beijing…on a clear day and otherwise. Photo by Bill Bishop, Washington Post, via ifindkarma. Beneath the layer of soupy smog, however, there is tremendous human-powered potential for positive change. The World Health Organization’s Air Quality Guidelines state that by reducing the levels of particulate matter in our urban areas from an annual average of 0.07 to 0.02 milligrams per cubic meter, air-quality related deaths could be cut by around 15%. 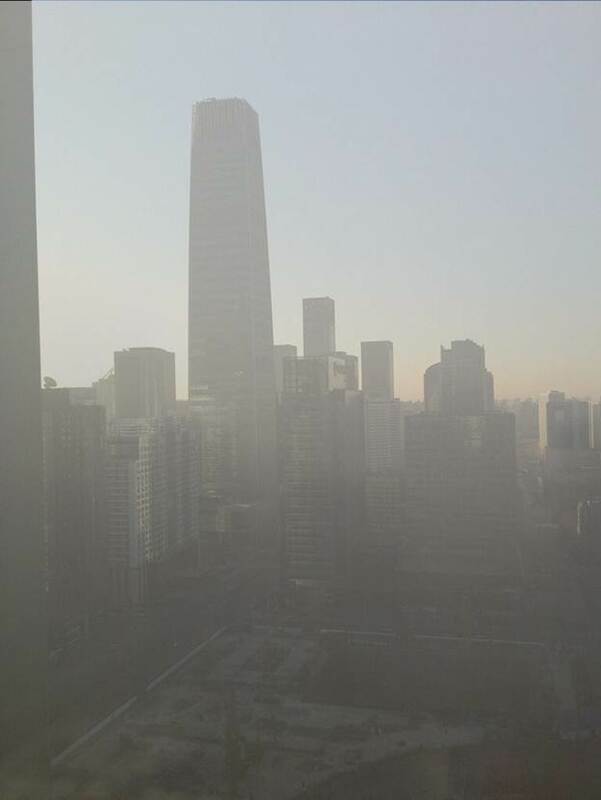 On January 12, 2013, the US Embassy in Beijing measured record levels of particulate matter at 0.886 milligrams. As researchers in sustainable urban transport, we were interested in simulating what would happen to Beijing if transportation-related air pollution were removed. Research by the International Council on Clean Transportation (ICCT) reveals that auto emissions contribute to 34% of air pollution in Beijing, Shanghai, and the Pearl River Delta region. Therefore, with the magic of photo-editing, we transposed the photo of the polluted day onto the photo of the clean day and changed the opacity rate of polluted day photo to 66% (assuming the 34% auto emissions pollution is removed). This is what it would look like. The same skyline with transport emissions removed. Photo by Heshuang Zeng, via ifindkarma. Though still not ideal, at least you can see the building in front of you on the worst air pollution day in Beijing.